Mariemont.com is an independent website that has no affiliation with the Village of Mariemont Government. It is a Web based ‘village voice’ to serve the interests of Greater Mariemont. As a noncommercial community asset, our mission is to be a ‘one stop repository’ of fair and objective information about the social organizations, events, happenings, businesses, community services and local government. To augment the free exchange of information and provide an editorial platform for Greater Mariemont, the Web site has a blog. Postings on the blog include a wide variety of topics including featured businesses, performances, events, awards, appointments, schools, sports, meetings, real-estate statistics, medical matters, editorial opinion and so on. The opinions expressed on the Blog are those of the author(s), and do not necessarily represent the view of other contributors to the Site. Our editors steer clear of village politics. However, we are obligated to present a balanced and cogent discussion of viewpoints that stem from various meetings and issues affecting all residents in Greater Mariemont. And we always invite outside qualified editorial content that may offer viewpoints that may, at times, be contrarian but which stimulate open debate and produce a running stream of insightful comments on the blog. We are an information asset that listens to the concerns of all the citizens of our great community. Richard Wendel MD, MBA, a retired Urologist and long term resident of Mariemont with entrepreneurial experience and a rich volunteer background including SCORE counseling, the Osher Life Long Learning Institute at University of Cincinnati and Leadership Cincinnati. Larry Goetz, BA, ME, who is a Mariemont icon and retired Director of Video Productions in the Mariemont School System. He was the stage manager for Mariemont School stage shows and has produced a broad range of videos about Greater Mariemont, Mariemont School events and the Mariemont Preservation Foundation. Few realize that he was the principal at Cardinal Pacelli School prior to coming to Mariemont and was the regional director of Destination Imagination, a creative thinking program designed for school children. Claire Kupferle, the well-known Editor of the Mariemont Town Crier is also on the team. Claire serves on the Board of the Mariemont Preservation Foundation as Secretary, and is the Director of the Little Tiger program at Cincinnati Taekwondo Center on Red Bank Road. Her background is in advertising and marketing, a career she pursued after graduating from Denison University. 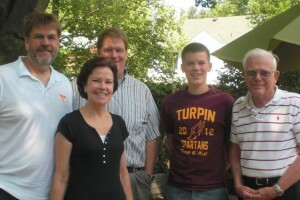 Courtney Scheeser (not pictured), P&G Employee and Former Mariemont Councilman, has joined our team as a contributor. Susie Weinland (not pictures), Magazine Editor and Freelance Writer, has joined our team as a contributor.